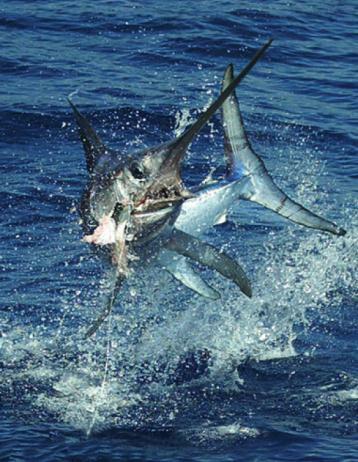 Swordfish ... (Xiphias Gladius) are amazing fish that often make huge leaps out of the water while hooked up. The swordfish, scientifically known as Xiphias Gladius, and nicknamed “broadbill,” is one of the most recognizable and desired fish in the water. Known and named for the sword on the front of their face, the elongated bill combined with their sleek bodies, allow the Swordfish to glide straight through the water. The sword isn’t actually used to stab like manmade ones, rather they use their long noses to slash at and debilitate their prey, making it easier to catch. Swordfish range in color, but most are either dark brown or black on top, with lighter sides and belly. Females are the larger members of the species and usually mature between 4 to 5 years of age. Males mature about a year earlier, and usually won‘t grow beyond 200 pounds. Some populations of Swordfish spawn year round, while others only do so between March and July. Swordfish have a unique trait that gives them a slight advantage in the water. Like other fish, they are cold-blooded, but they have special heating devices behind their eyes that warm the brain. This helps them survive in colder temperatures and greatly improves their eyesight, thus making them better and more versatile hunters. The ability to warm body parts is rare in the fish community, so Swordfish have one up on most others. Swordfish are migratory and usually travel alone. They only associate with other Swordfish for mating purposes. They feed on smaller fish and squid, and have to eat daily. Feeding mainly at night, they attack schools of fish while thrashing their bill, then go back and eat the injured that get left behind. This has proven to be an effective technique for them, as they are able to get a multiple of fish with one surge through a school. The bill of the swordfish is flatter than the more rounded bills of the marlin and sailfish. The best fishing techniques are trolling or deep drifting. Anglers should try fishing at night when they are more actively feeding. 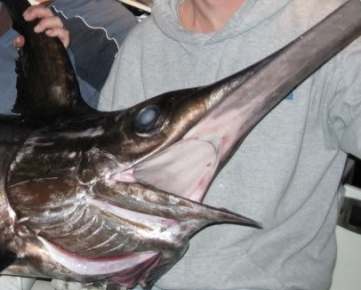 When bait is used, Swordfish respond best to live squid. They can be quite violent on a line and are known to leap out of the water to get unhooked. Catching a Sordfish is no easy task, and anyone who succeeds is highly admired in the angling world. Swordfish meat is fantastic for eating and is highly sought after. The difficulty in catching Swordfish makes them a delicacy in many restaurants. As of right now, the Swordfish population is not in any danger of extinction, which could be due to the difficulty of catching them. They can fight their way out of most any situation, keeping their numbers high, and the desire for them even higher.